Membership in the International Fire Marshals Association Section tailors your NFPA benefits to your industry and puts you in direct contact with fire marshals across the globe who have expertise in fire safety, property inspection, and engineering. You'll be able to call on these professional contacts to solve problems, and gain insight into tomorrow's biggest challenges. Plus, IFMA will keep you up to date on information geared to the fire prevention, public fire and life safety, educational, and fire investigation communities. Advance your career through CEUs, educational seminars, and professional development critical to your success on the job. Plus, Section leadership and publication opportunities help you build credentials and enhance your reputation as an expert in your field. Member – A fire official, who has been lawfully appointed and authorized by the authority having jurisdiction and charged with the statutory responsibilities and duties for fire prevention accomplished through enforcement of fire laws and regulations, property inspections, public fire safety education, or investigation of the cause and origin of fires are eligible for membership. Associate Member – A member of NFPA who does not qualify for Member status as outlined above. Associate Members shall not hold an elective office or vote in the affairs of the Association. Affiliate Member – An Affiliate Member of the NFPA who is interested in the stated mission and objectives of the International Fire Marshals Association. Affiliate Members shall not hold an elected office or vote in the affairs of the Association. Stay up-to-date with what's happening with the International Fire Marshals Association Section and participate in discussions by visiting NFPA's Xchange community (login required). The International Fire Marshals Association (IFMA), formerly known as the Fire Marshals Association of North America, was organized in 1906; in 1927 it was reorganized as the Fire Marshals' Section of NFPA. Unite for mutual benefit those officials engaged primarily in the prevention of fire, the investigation of fires, and/or public fire and life safety education. Provide educational and professional development opportunities through technological, certification, and prevention programs. Provide a resource service to its members. Actively market and promote a positive, dynamic, and proactive profile. Actively participate in the codes- and standards-making process at the international, national, state, and local levels. Monitor fire safety issues at the international, national, state, and local levels. Develop mechanisms for Chapters to participate in the Association. MEMBER: A fire official who has been lawfully appointed and authorized by the authority having jurisdiction and charged with the statutory responsibilities and duties of fire prevention accomplished through enforcement of fire laws and regulations, property inspections, public fire safety education, or investigation of the cause and origin of fires. ASSOCIATE MEMBER: A member of NFPA who does not qualify for member status as outlined above. Associate members shall not hold an elective office or vote on the affairs of the Association. AFFILIATE MEMBER: A member of NFPA who is interested in the stated mission and objectives of IFMA. Affiliate members shall not hold an elected office or vote on the affairs of the Association. Membership applications are available on request. Here are some ideas on how you can stay involved with your Section's activities. Maximize resources to minimize loss! 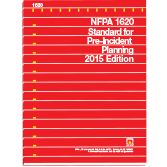 NFPA 1620 facilitates pre-incident planning for all types of emergencies and destructive events. 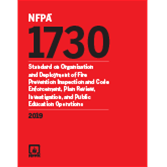 NFPA 1730 helps jurisdictions identify needs and establish Community Risk Reduction plans. Executive Board A list of current section directors. Constitution & Bylaws Read and download section bylaws.